Attempting to recreate this protocol (from UC Davis precis of American Journal of Enology and Viticulture. 58(4):451-460. 2007), which looks at extraction of polyphenols from grapes. Aim to test identification and quantification using UV spectra. 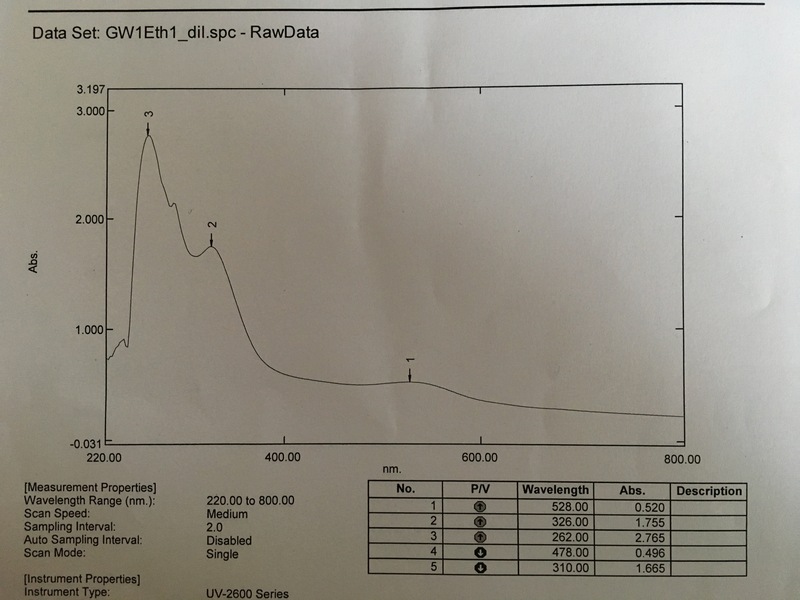 NB: difference from linked protocol - after fiddling with acidification and finding it difficult to raise the pH, I went ahead without acetic acid addition. Solvent 50% solution ethanol or surgical spirit. 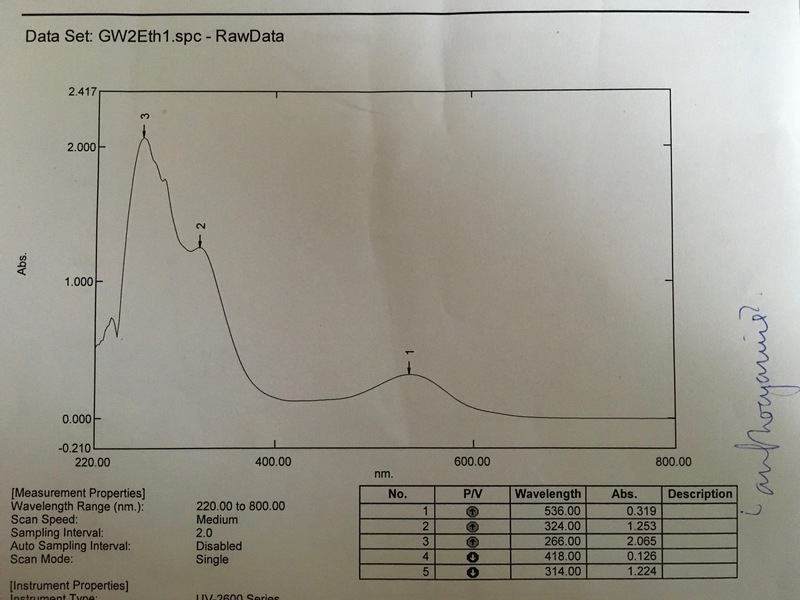 The outputs look like anthocyanin peaks at around 500nm and perhaps some baicalein at the lower end of the spectrum. The Desktop Spectrometer V3 spectrum doesn't register the lower peaks. At first the spectrum didn't work well and had a lot of noise, probably due to high opacity due to colloid from the caster oil. I centrifuged for 5 minutes and removed the top layer to run the spectra again. The lab UV spectrum falls down at the lower nm due to some interference. Probably from the caster oil contamination. This region is lost in the Desktop Spectrometer V3 spectrum below. Can I purify the surgical spirit safely so that the UV spectrum is clearer? 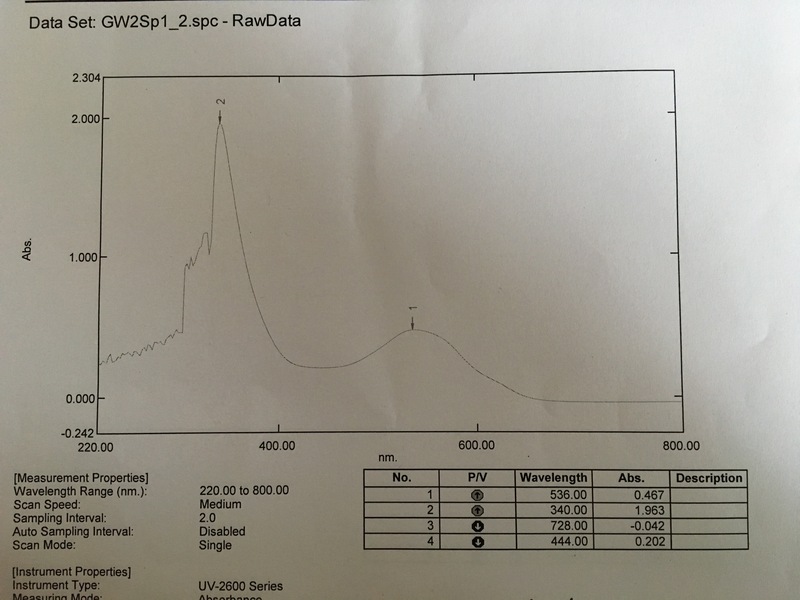 Can I use a UV light to measure the spectrum below 300 nm? Is there a facility for this on SpectralWorkbench.org? The sensors in consumer cameras have very low sensitivity at wavelengths shorter that 400 nm. Some cameras are slightly sensitive down to about 380 nm when the IR cut filter is removed. Most UV light is blocked by standard glass, so that contributes to poor camera sensitivity in the UV. Also - I noticed you're using a compact fluorescent lamp as a light source - but are you measuring absorption? In that case you probably want a broad spectrum light source. May I ask what kind of spectrometer(s) you're using, and could you share more about your experimental setup?